All across the country, theme parks are being transformed into winter wonderlands to the glee of children and families. These are special and time-limited events. Trekaroo wants to make sure that you know a few of the ways to spend the holidays at theme parks across the USA. Updated for 2018! Disney Parks know how to celebrate the season with an amazing amount of Mickey magic. So much so, we have an entire article devoted to the holidays at Disneyland. 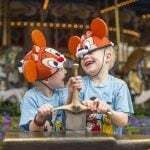 We also have an article highlighting Christmas at Disney World. Busch Gardens Tampa Bay is hosting “Christmas Town.” Christmas Town opens on November 17th runs daily through December 31st. Sing carols while riding on the Christmas Town Express. After heading the music, visit with Santa. Watch “Elmo’s Christmas Wish”, and enjoy holiday décor throughout the park. 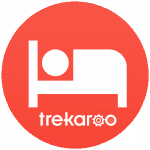 Trekaroo families praise the park for its attention to detail catering to families of all ages. Families can now meet Rudolph and the cast of the 1964 movie. After the New Year, come back to the park for The Three Kings celebration the first week of January. 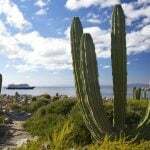 Find amazing deals at family-friendly hotels near Busch Gardens Tampa Bay. Meanwhile, a little further north at Busch Gardens Williamsburg, “Christmas Town” opens on November 17th and is open Fridays-Sundays from the opening day through January 5th and weekdays between December 7th-January 1st. 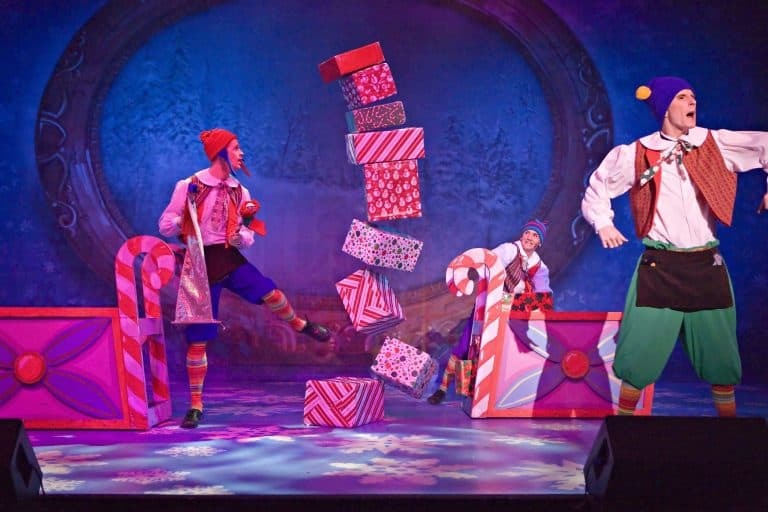 During their visit, guests can eat a meal hosted by Santa and Mrs. Claus, ride the Peppermint Twist, or watch one of the several live shows. Trekaroo families rave about the holiday lights. 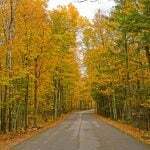 Check for deals on hotels near Busch Garden Williamsburg. Cedar Fair Entertainment Company runs amusement parks across the country and they are gearing up to bring some incredible holiday fun. As shown in this historic photograph of Santa riding the log ride at Knott’s Berry Farm in Buena Park, California, Knott’s knows about winter holiday fun. It transforms into Knott’s Merry Farm starting November 16th. 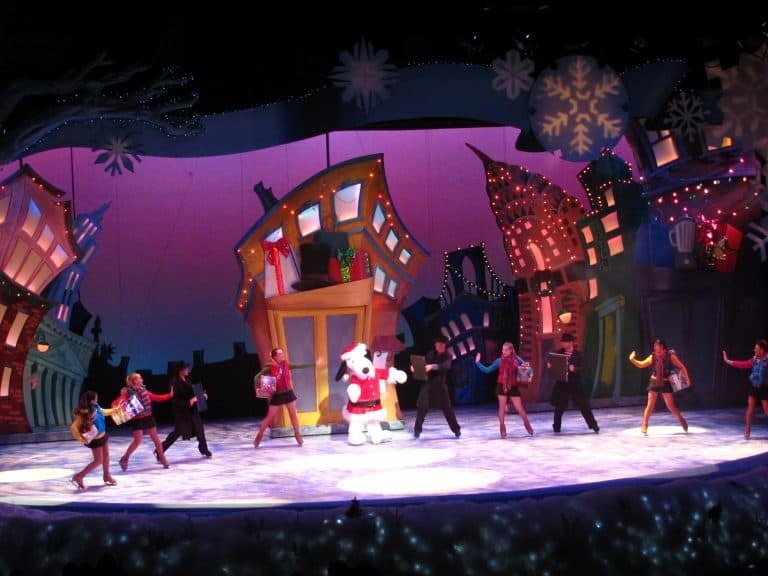 Guests will love seeing Snoopy light the Christmas tree every night, and watch the Peanuts crew in a holiday-themed ice show. Still feeling like holiday cheer in the new year? Knott’s Merry Farm continues until January 6th. Northern California’s Gilroy Gardens Family Theme Park comes alive with thousands of lights for the Holiday@night display, Santa, a “Charlie Brown Christmas” show, and ice skating on weekends from November 23rd through the holidays. 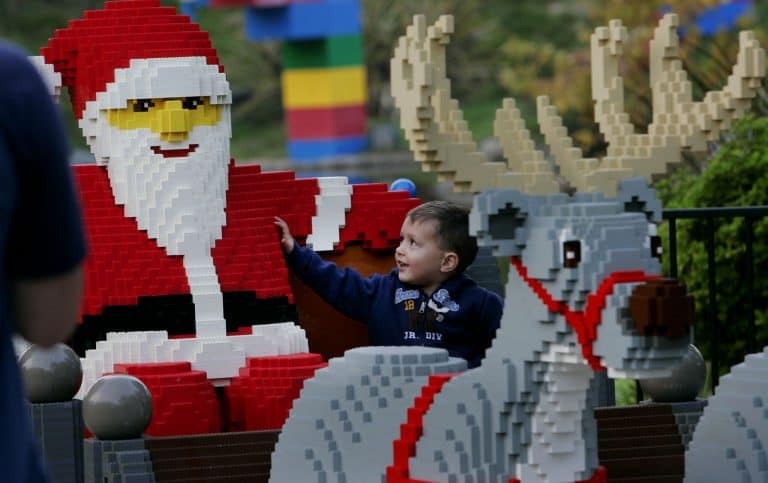 Join families as they experience “Christmas Bricktacular” at LEGOLAND Florida. Running December 1-2, 8-9, 15-16, 21-31, 2018, the festivities include an incredible Christmas tree and accompaniment made of LEGO and Duplo bricks. Also, join the hunt for LEGO Santas. Kids can write letters to Santa as well. Before turning the clocks to a new year, head to LEGOLAND for a fun event. LEGOLAND Florida hosts a fireworks display for “Kids New Year’s Eve” with a full party just for younger kids including a ball drop on December 26th-31st in the evenings. Look for deals on fun family-friendly hotels near Legoland Florida. On the other side of the country at LEGOLAND California, come explore Brickacular November 17th- December 31st. Take a picture with LEGO Santa at the holiday village, new for 2018. Eat holiday-themed treats. Enjoy holiday entertainment with the LEGO Friends. 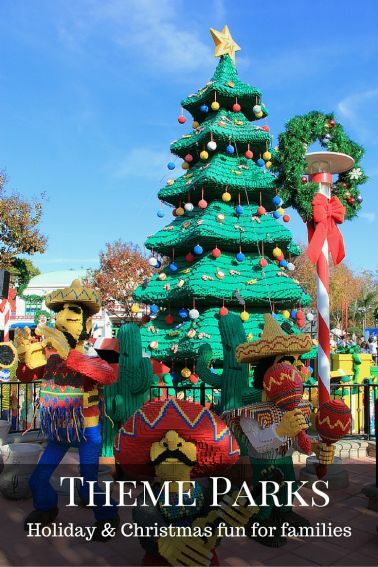 Join LEGOLAND California for the “Kids New Year’s Eve” as well on December 31st. Check for availability at hotels near Legoland California. All three SeaWorld parks, located in Orlando, San Antonio, and San Diego, are offering a variety of winter-themed events for young and old. All three parks are participating in “SeaWorld Christmas Celebration”. They will be featuring several Christmas Celebration shows including: “Shamu’s Christmas: Miracle,” which will showcase lights and shows set to holiday music. Trekaroo families especially enjoy the decorations and shows during the holiday season. The dates of the holiday events do vary by location. SeaWorld Orlando’s celebration will happen on select nights between November 17th- December 31st. The special events are included with the price of admission. SeaWorld Orlando is also offering families an meet and greet dinner with Santa in Shamu Stadium. SeaWorld San Antonio’s holiday events will run on select dates from November 17th- January 6th including all of Thanksgiving week as well as the week before and after Christmas. Families will enjoy five million holiday lights, Santa, and Rudolph. For added fun, catch the “Merry Mariachis” all season long. 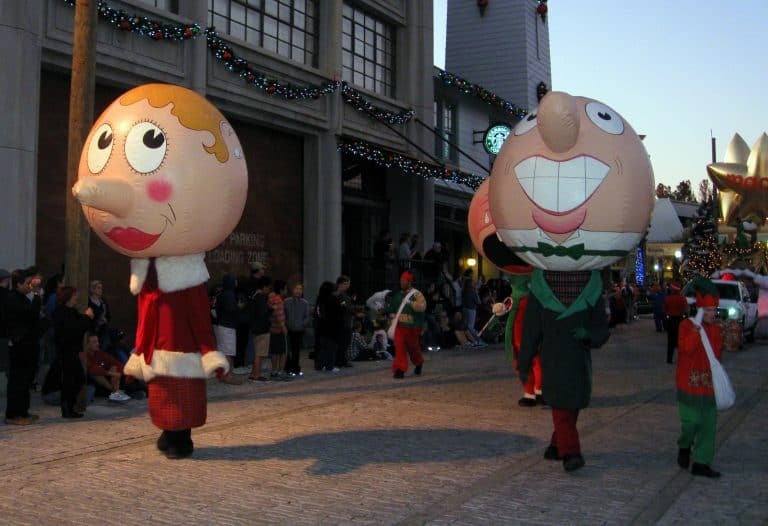 SeaWorld San Diego will be taking on the holiday spirit between November 17th and January 6th. The park’s live nativity musical returns in 2018. Families visiting SeaWorld San Diego can also see Rudolph and watch a dolphin holiday-themed show. The Six Flags amusement parks are gearing up for the holiday season. With shows featuring the holiday spirit and visits with Santa, Six Flags is sure to pack a punch of its namesake exhilarating rides, all with a holiday spin. After the rides, calm your sweet tooth with s’mores for the whole family at a winter outdoor scene complete with sleigh and trees and Christmas-inspired funnel cakes! Then, find Santa and his reindeer who will be at Six Flags Over Texas, Six Flags Magic Mountain, and Six Flags Discovery Kingdom. Six Flags Fiesta Texas has a holiday train, carolers, and a live nativity. 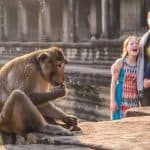 Trekaroo families bragged about the Looney Tunes and Christmas characters and the “Holiday in the Park” experience. 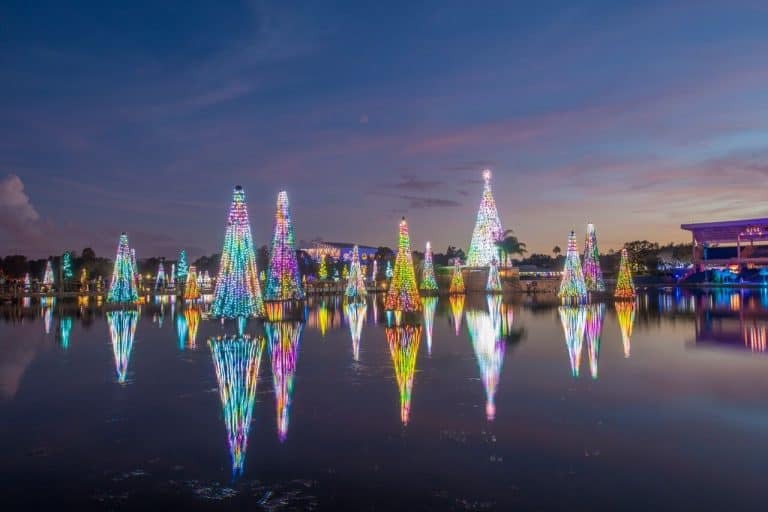 “Holiday in the Park” is available varied dates at the following parks November 16th- December 3oth so please double check prior to planning your trip. Six Flags Fiesta Texas in San Antonio, Six Flags Magic Mountain in Valencia, CA, Six Flags Over Texas in Arlington, TX, and Six Flags Discovery Kingdom in Vallejo, CA accommodate the holiday cheer with the temporary closures of some of the usual attractions. Universal Studios Orlando offers a unique experience for families. First, New York City Macy’s Thanksgiving Parade floats and balloons make their way down to Florida each year. Next, Universal Studios then adds its own flair, and voila, a parade of epic proportions without the chill of NYC. 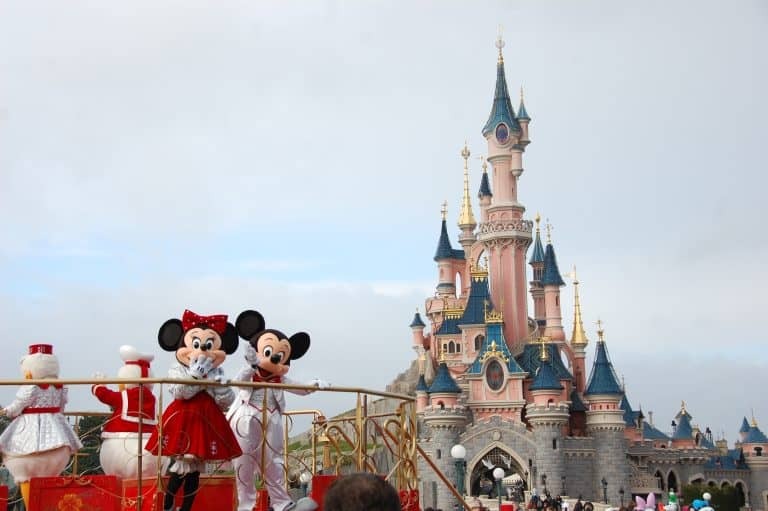 Guests can see the parade on November 16th- January 6th. Then, catch the fan favorite, Grinchmas returns this year with lots of activities surrounding the green monster and Who-ville. Universal Studios Orlando’s holiday experience has expanded to include Harry Potter. Now families can experience Christmas in Rowling’s London. Universal Islands of Adventure (next door to Universal Studios Orlando) is putting on Grinchmas: a tribute to the Grinch and the Whos of Whoville. 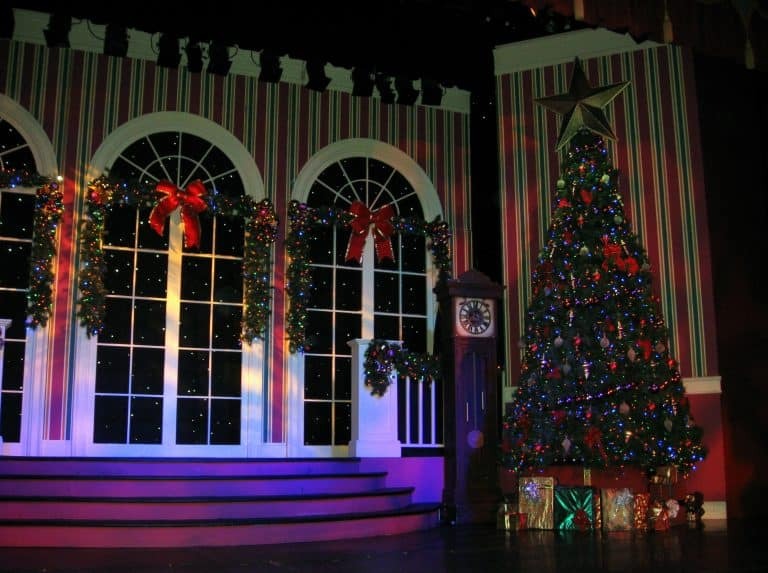 Have breakfast with the Grinch, then catch a holiday-themed play. Also, be sure to fly over to Hogsmeade and Hogwarts for more holiday cheer. 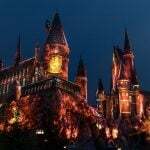 Universal Studios Hollywood is also hosting Christmas in the Wizarding World of Harry Potter select dates November 17th through January 6th and Grinchmas December 1st through the 30th.